If you have been searching for the perfect white tee – you must search no longer! I’ve found it for you and it’s under $20! Eek!!! I squeal for joy! 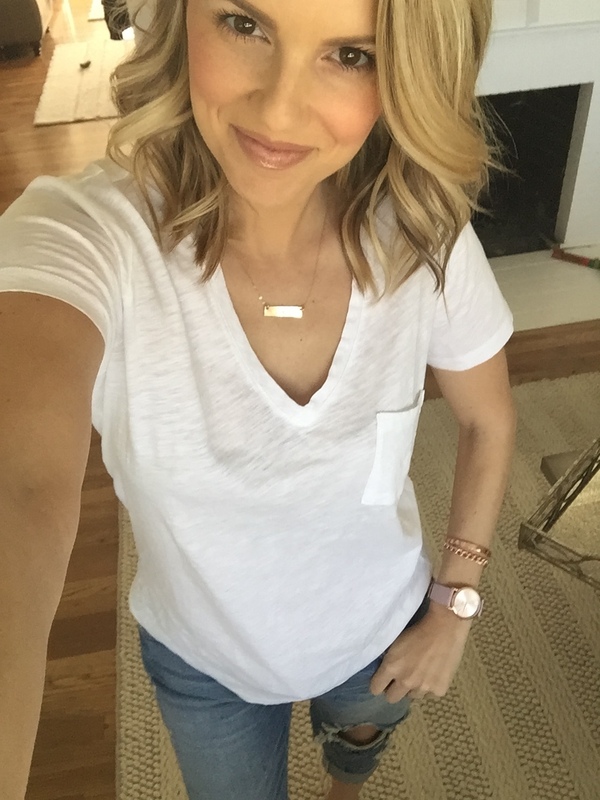 This white t-shirt is just my absolute favorite (along with my slouchy tee that you can see me wearing HERE– I LOVE it too!). And it took me a long time to find this tee. I think I ordered at least 7 different white tee’s this month and sent them all back because the fit was terrible or the fabric felt stiff. Then I found this t-shirt and I’m SO happy. I bought it is a couple other colors too. Plus is does a pretty good job hiding my bump! I’m wearing a medium FYI. My boyfriend jeans are over %50 off right now which is amaze! And so is my shorter necklace! Gotta love %50 off! Best thing about this look is that the t-shirt, cuff bracelet, and watch are all under $20! Love the outfit and especially love finding a good white tee. What size are you wearing in the white tee? I think I’d be the same size as you and I’m not sure if I’d need an xs or s.
I’m wearing a medium. I usually wearing a small or medium in tops. I would size up 😉 So if you can wear xs – go with the small. Where is the t from? I have the same peonies on my coffee table! And I’m also a blogger. 🙂 Great minds think alike! Are you still curling your hair using the Sultra? Ordering two of these now… thanks for sharing! Ps – you are adorable! I agree with you too Ali. But I have to say that I hope Becca is the next Bachelorette. Hey Ali! I randomly stumbled across this blog while searching on Google for something totally unrelated. As a guy, I can’t say I’m much into the fashion tips–but as a web designer I really like the layout & design of your blog…nice job! While I’m here–I just wanted to say that I thought your season of The Bachelor was one of the best ever. I’m not gonna lie, to this day I still have a crush on Tenley…ha ha. Ali how do you style/curl your hair?? Thanks for the post… I just got this t shirt and love it! !